A study led by researchers at the University of Colorado Boulder (CU Boulder) and published in the journal Nature Climate Change last month explored whether or not gender quotas for local governing bodies could help reduce deforestation while addressing local inequalities at the same time. For the study, researchers traveled to 31 villages near collectively managed forests in three developing countries — Indonesia, Peru, and Tanzania — and asked 440 forest users in those communities to play a tabletop simulation game in which they had to make decisions about how many trees to harvest from a shared forest. The participants were divided into groups of eight, and half the groups were required to have women as 50 percent of their members. The other half of the groups had no gender quotas. Many of the world’s threatened forests are collectively owned and managed by small community groups. Because women frequently have no decision-making powers in those groups, some legislatures and local governments have mandated that a certain number of decision-makers must be women. Gender quota policies in countries like Argentina, India, and Rwanda, for instance, have stipulated that 30 percent or one-third of membership and executive leadership in local governing bodies be women. Since 2009, Nepal has required that at least half of local committees representing forest communities be women. The authors write in the study that their results “show that gender quotas make interventions more effective and lead to more equal sharing of intervention benefits.” They add that their findings “demonstrate that there is potentially even greater benefit when quotas are progressively set at full gender parity” rather than the common 30 percent or one-third standard. For the study, the researchers traveled to 31 villages near collectively managed forests in three developing countries — Indonesia, Peru, and Tanzania — and asked 440 forest users in those communities to play a tabletop simulation game in which they had to make decisions about how many trees to harvest from a shared forest. The participants were divided into groups of eight, and half the groups were required to have women as 50 percent of their members. The other half of the groups had no gender quotas. First, all participants played a round of the game where were they were told they’d be given a small payment of 5 tokens for each tree they chose to harvest, and were asked to anonymously choose how many trees to cut down. Next, the participants were told that an external organization would pay their group 160 tokens if they made the group decision not to cut any trees down, such as would be the case if the community was enrolled in a Payments for Ecosystem Services (PES) program, and that they could elect a leader who would decide how to distribute the tokens among the members of the group. “We found that the groups with the gender quota reduced their harvesting rate far more when the incentive was introduced and also distributed the payments for conserving more equally,” lead author Nathan Cook, a postdoctoral research fellow at CU Boulder, said in a statement. There was no meaningful difference between the decisions made by the groups in the absence of a financial incentive, but once an incentive was offered the groups with gender quotas reduced their harvesting rate by 51 percent while the control groups cut theirs by just 39 percent. In other words, the groups with gender parity kept more trees standing in response to a PES scenario and shared the payments more equally amongst themselves. The researchers say that they attribute this outcome to the gender compositions of each group, not necessarily to leadership by women. There wasn’t much difference between the choices made by groups that had selected a woman as their leader versus a man. Instead, the consistent outcome was that when at least half of the members of a group were female, that group chose to cut down fewer trees — especially once a shared financial incentive was introduced. 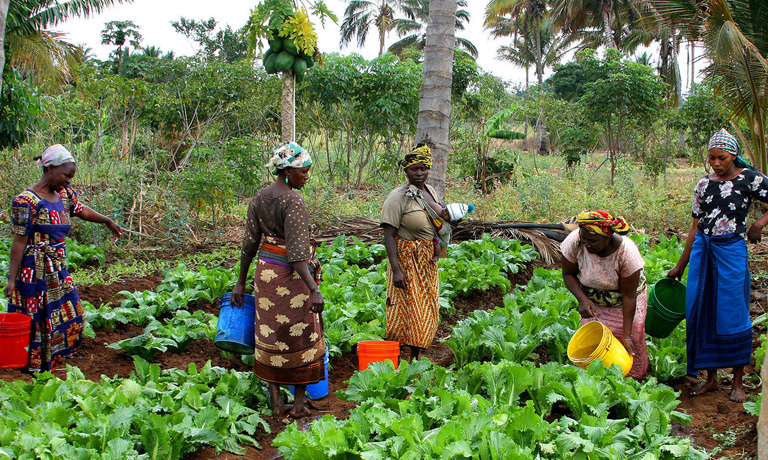 Farmers in Tanzania. Photo courtesy of CU Boulder.